There is something special about autumn. Besides the clear blue skies, bright Sun, and natural beauty that adorns the Earth, a strange divinity and spirituality suffuses the atmosphere. Navratras (nine sacred nights), fall in autumn. Navratras, observed twice in a year (autumn and spring) mark the transition in seasons, summer to winter and winter to summer. According to Indic thought, this transition period in nature spans roughly nine days and nights. During these nine sacred nights, fasts are observed for purification – both physical and ethereal. During this period, weather changes and various energies of creation move from imbalances towards a new normalcy. Since we are an integral part of the creation, the prana shakti inside our body undergoes a process of re-alignment from imbalance to a new balance for the new season. For this, the body has to be kept light. According to Ayurveda, during this time, one should consume simple natural food in minimal quantities to rid the body of toxins. Such food nourishes both body, and soul. Put almonds in a bowl and pour a cup of boiling water on them. Cover the bowl and let them sit for 10 minutes. Drain off hot water and wash them with cold water. Now remove the skins. 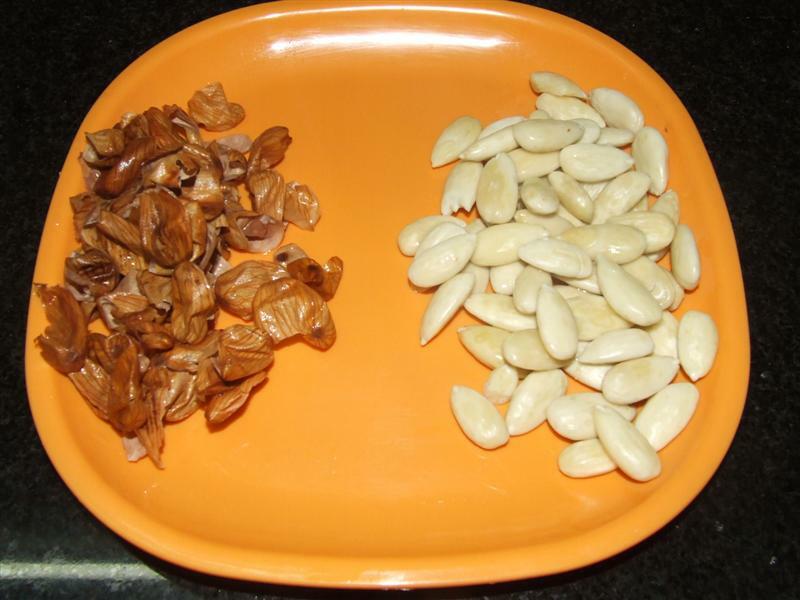 Reserve about five to six almonds and grind the remaining blanched almonds in a mixer with ¼ cup of water. Heat ghee in a heavy bottom steel wok or any heavy bottom pan. Add almond paste and cook over low flame till the color changes to pinkish brown. Add milk and mix well. Bring it to a boil over high flame stirring continuously. Reduce the flame, add sugar and let it cook for about 20 minutes stirring occasionally. Turn off the gas. 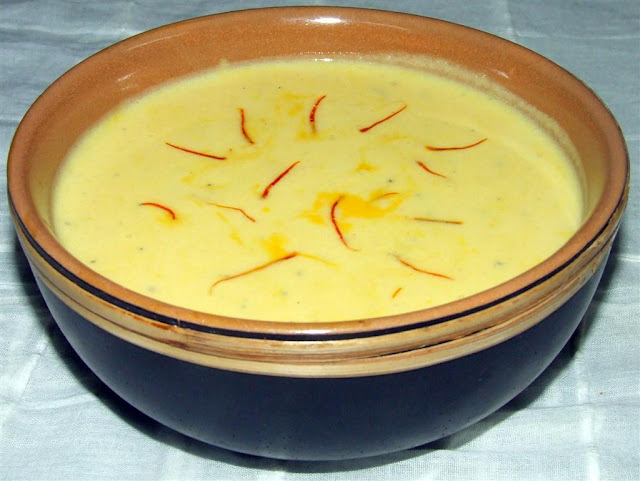 Add cardamom powder and saffron strands soaked in warm milk. Finely chop the peeled almonds and add them to kheer to get a nice chewy feel. Serve warm or at room temperature. My notes: Ghee can be avoided. If you are doing so, add milk to the paste and cook. 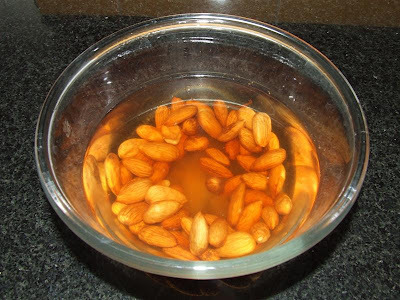 Keep the sugar less to feel the blandness and sweetness of the almonds. If you liked this recipe and tried in your kitchen, do write to me. I would love to hear from you. Happy Navratras!